Our universe may contain 100 billion galaxies, each with billions of stars, great clouds of gas and dust, and perhaps scads of planets and moons and other little bits of cosmic flotsam. The stars produce an abundance of energy, from radio waves to X-rays, which streak across the universe at the speed of light. Yet everything that we can see is like the tip of the cosmic iceberg — it accounts for only about four percent of the total mass and energy in the universe. About one-quarter of the universe consists of dark matter, which releases no detectable energy, but which exerts a gravitational pull on all the visible matter in the universe. Because of the names, it’s easy to confuse dark matter and dark energy. And while they may be related, their effects are quite different. 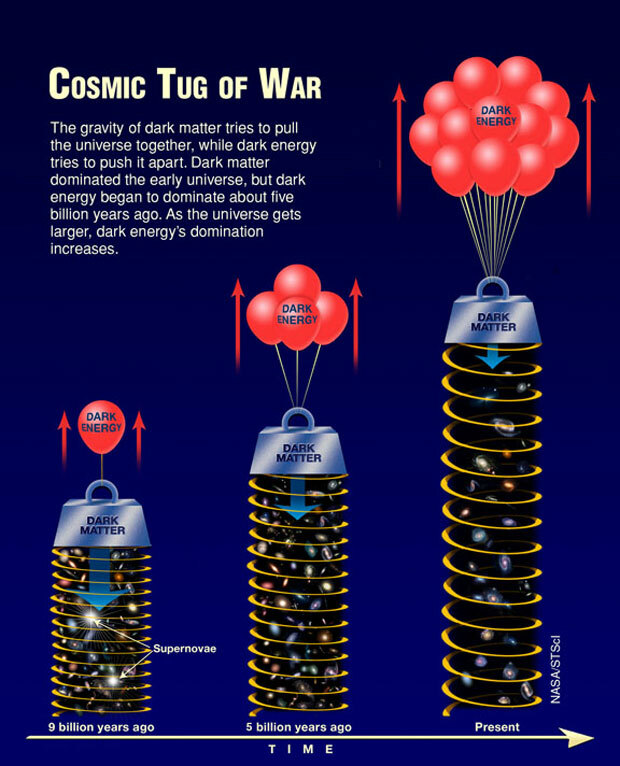 In brief, dark matter attracts, dark energy repels. While dark matter pulls matter inward, dark energy pushes it outward. 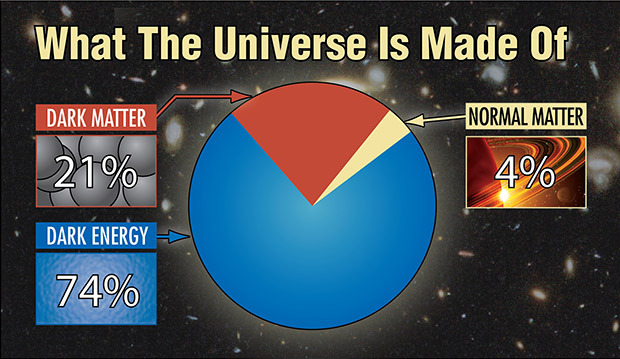 Also, while dark energy shows itself only on the largest cosmic scale, dark matter exerts its influence on individual galaxies as well as the universe at large. In fact, astronomers discovered dark matter while studying the outer regions of our galaxy, the Milky Way. The Milky Way is shaped like a disk that is about 100,000 light-years across. The stars in this disk all orbit the center of the galaxy. The laws of gravity say that the stars that are closest to the center of the galaxy — which is also its center of mass — should move faster than those out on the galaxy’s edge. Yet when astronomers measured stars all across the galaxy, they found that they all orbit the center of the galaxy at about the same speed. This suggests that something outside the galaxy’s disk is tugging at the stars: dark matter. 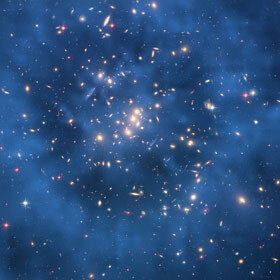 Calculations show that a vast "halo" of dark matter surrounds the Milky Way. The halo may be 10 times as massive as the bright disk, so it exerts a strong gravitational pull. The same effect is seen in many other galaxies. And clusters of galaxies show exactly the same thing — their gravity is far stronger than the combined pull of all their visible stars and gas clouds. Are dark matter and dark energy related? No one knows. The leading theory says that dark matter consists of a type of subatomic particle that has not yet been detected, although upcoming experiments with the world’s most powerful particle accelerator may reveal its presence. Dark energy may have its own particle, although there is little evidence of one. Instead, dark matter and dark energy appear to be competing forces in our universe. The only things they seem to have in common is that both were forged in the Big Bang, and both remain mysterious.